I've been trying to branch out and find new recipes for the ketogenic diet I'm on and had to grab this cookbook when I saw it. I'm all for slow cooker recipes or one pot meals mainly because they tend to be quick and easy or just set it and forget it. I found some amazing new recipes that make meal prep a breeze and quite a few more adventurous recipes I never would have tried before. This past weekend I did the "Make-Ahead Freezer Meatballs" and it makes a ton so whenever you need a quick meal after work you can pop them in the oven or on the stove top and you have a yummy dinner. 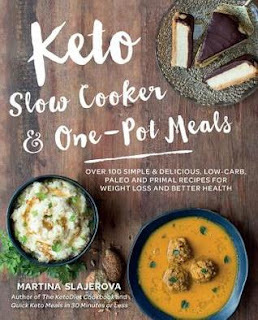 If you're looking to expand your recipes for the ketogenic/keto diet this might be the book for you. I'm not very familiar with the Keto diet, but to find a slow cooker recipe book would be a big boost to helping keep to the diet. Glad it was a winner for you. Glad you found a good cookbook. It is always great to find new recipes to love. Even better if they are easy. I hope you find many more great recipes.